LOCALS with a disability set sail last Thursday for another year of fun on the water. Sailability runs each year from March to September and gives adults with a disability a chance to enjoy the great outdoors in a safe environment. This year the group, which runs out of the Noosa Yacht and Sailing Club, designed a new cushioned seat to make the experience more comfortable. 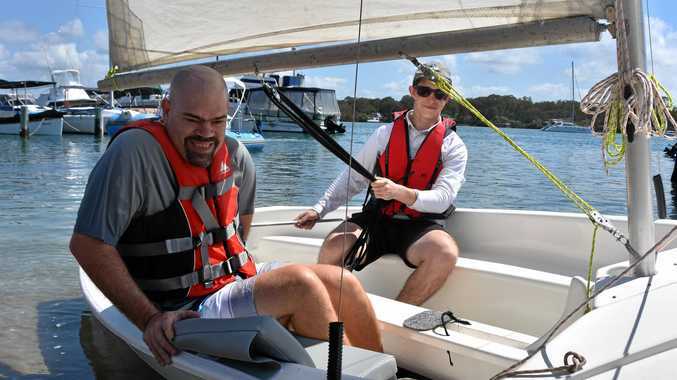 "What we have learnt over the years is that for some people with a disability these sailing boats are not comfortable,” Sailability coordinator Ken Plunkett said. Mr Plunkett said it was an enjoyable activity for participants. With the sun shining bright and a light northeasterly breeze, Thursday made for perfect conditions. Endeavour Foundation Noosa support worker Jamie Lyons said their members looked forward to the program in the weeks leading up to it. "It a great way of leisure and skill building. They absolutely love it, and engaging with the local community,” Mr Lyons said. The seats were made possible thanks to community support. Canvas Marine Covers in Noosaville manufactured the product while Davos Tackle World financed the project.